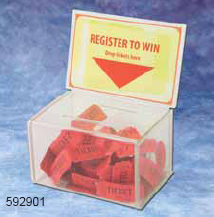 These ballot boxes and comment boxes create interest in your giveaways, donations and charities. Commonly refered to as donation boxes or suggestion boxes, these boxes also have ample room for displaying colorful signs and graphics. There are many sizes ballot boxes to choose from, and some include locking mechanisms for extra security, or are made of smoke color material so the contents are not visible from the outside. Insert your custom graphic or picture to gain extra attention into our models with signframe headers. 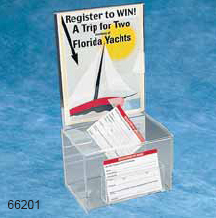 These high quality ballot boxes are very sturdy and look great on your counters and tables. This clear acrylic ballot box can come with or without header. 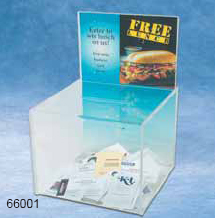 The Ballot Box header holds material up to 8" W x 14-3/4" H. (8" x 6" viewing area) BallotBox measures 8" W x 8" H x 8" D.
These clear acrylic coin boxes are available with or without a header. The Coin Box header holds material up to 5" W x 7" H. This coin box mesures 5-1/8" x 3" x 3-3/8". 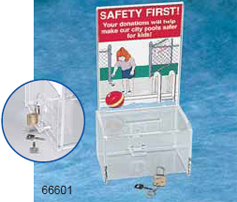 Our clear acrylic coin box is available with sign holder and a lock in the back for added security. The Coin Box header holds material up to 5" W x 7" H. Drop Box measures 5-1/8" W x 3" H x 3-3/8" D.